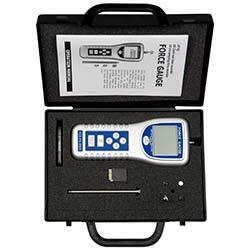 The force gauge PCE-FG 20 SD is a microprocessor-controlled meter. The force gauge allows getting an exact and quick read due to its large display. Furthermore the display features bright background lights that allow to perform measurements also at dawn or complete darkness. Depending on the planned measurement there could be added different measuring tips to the force gauge PCE-GF 20 SD that can be easily screwed onto the force gauge. 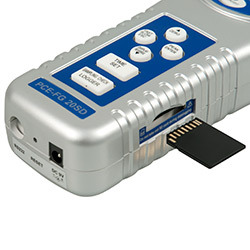 For special types of measurement the force gauge PCE-FG 20 SD features an extension, that can be connected to the device, too. Thus the force gauge provides the possibility of performing measurements even on-site, at locations, that are simply too narrow for an operator's hand. There are two ways to operate with the force gauge. There is the possibility of either operating on batteries or via adapter. The measured data of the force gauge PCE-FG 20 SD can be transferred onto a computer. Therefore the optional software can be connected with the device through a data cable. By that the determined data can be stored and later-on analyzed. And by that the device is made for long-term measurements. 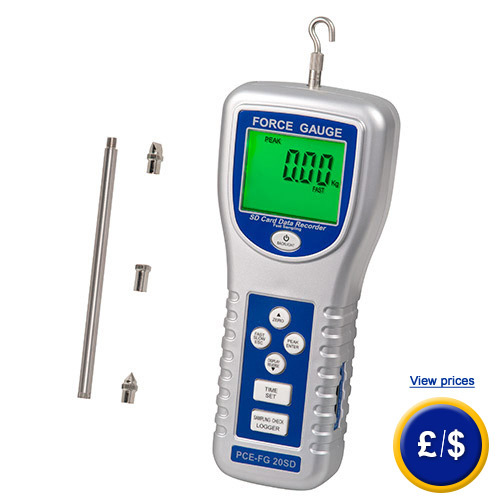 If there are any questions about this force gauge PCE-FG 20 SD, please have a look at the technical specification below or call: UK customers +44(0) 23 809 870 30 / US customers +1-410-387-7703 0. Our technicians and engineers will gladly advise you in all force testers and all products in the field of measuring instruments, regulation and control and scales. for businesses that want to admit the force gauge to their internal inspection-pool or at annual recalibration. The certification covers a calibration incl. certificate according to DIN EN ISO/IEC 17025. The software is for straight transfer of data to a computer. The data can be even sent to other programs like MS Excel. But if you have an USB interface at your computer or laptop, then an USB adapter must be used. The software package for the force gauge will be delivered with an RS-232 (9-pole) data cable. If your computer or laptop features no serial RS-232 interface a USB cable is necessary in order to use the software of the force gauge. 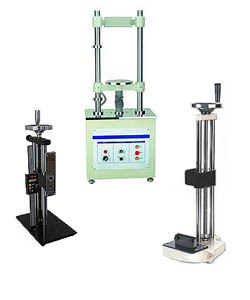 Since our test stands are designed for multiple force gauges, for some combinations of force gauges with test stands, there are adapter slides necessary, which assure a safe installation of the force gauge onto a test stand. 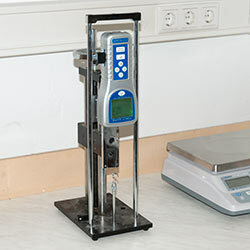 This force gauge can be combined with three different test stands. Two of them are equipped with a hand wheel, the third one is an engine driven test stand. The application of test stands only makes sense, if for example in a lab, there are repeatedly for perhaps daily product controls possibly the same frame conditions required (exclusion of human errors). The technical data of the test stands will be shown if you follow the link: test stands. Or you can read the details about the relevant test stands in their description under the category test stands.